Welcome to the last week of Project Life for 2013. I wrapped up my album and am excited to start on my journey with Digital Project Life in 2014. I used cards from the Holidays Mini Kit to complete my layout. I kept this week very, very simple. 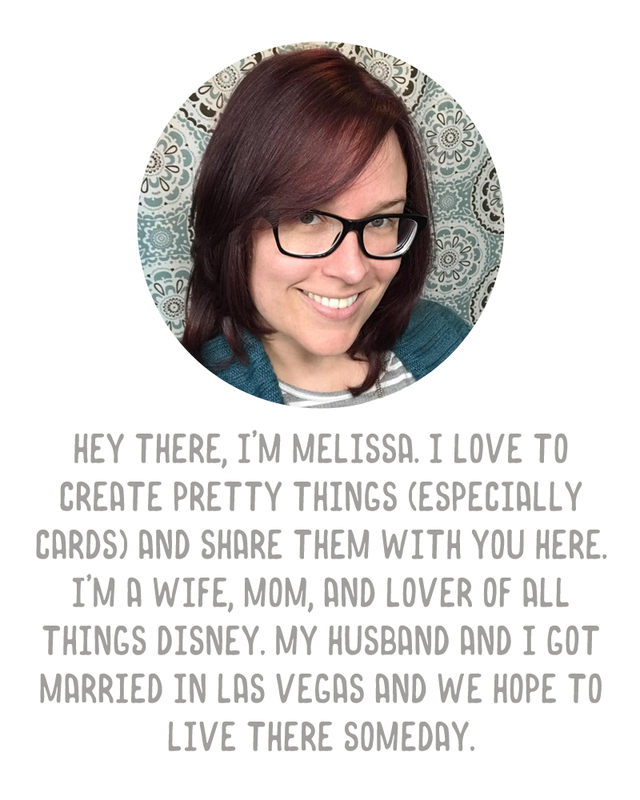 I just added a title card, my journaling, movie ticket stubs and some of the Project Life alphabet stickers from the Just Add Color kit and it was done. Christmas and Christmas Eve dominated most of the layout, of course. 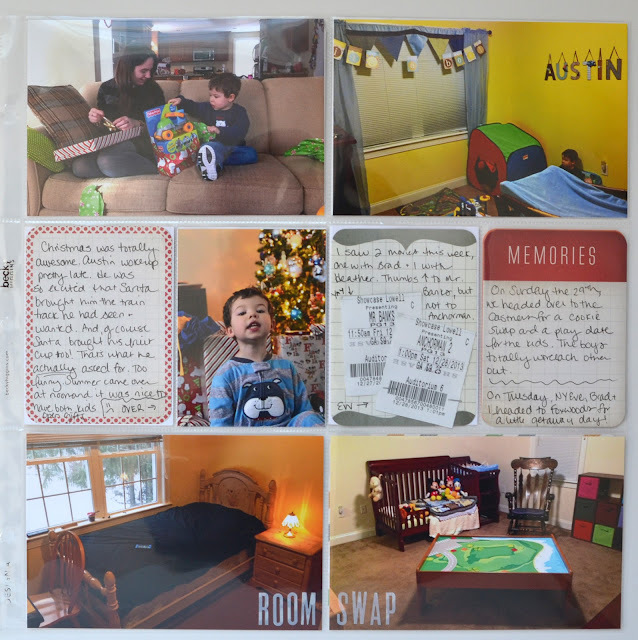 Also, we swapped the kids' rooms (Summer had the biggest room but isn't at our house that much and doesn't need the space that all of Austin's toys require, so we switched them). Both kids like their new rooms quite a bit - Summer is happy to be a little further down the hall from us parents, and Austin likes having all the room to play. I actually finished this album prior to New Year's Eve, so I just wrote a tiny blurb on the last card noting what Brad and I were going to do that day. I had these 3x4 cards from the Echo Park Memos package, and I hadn't used them yet. I thought the three of them together would work nicely for my last page. I just used some of the Simple Stories Snap alphabet stickers to add the "1 year", etc to the cards. I added in a photo of us, a random card from Studio Calico, two cards from the Amy Tangerine Cut & Paste mini kit, and one from the Vintage Travel kit, and the page was done. That's the end of 2013! What can you expect from 2014? Digital Project Life for my 2014 album. 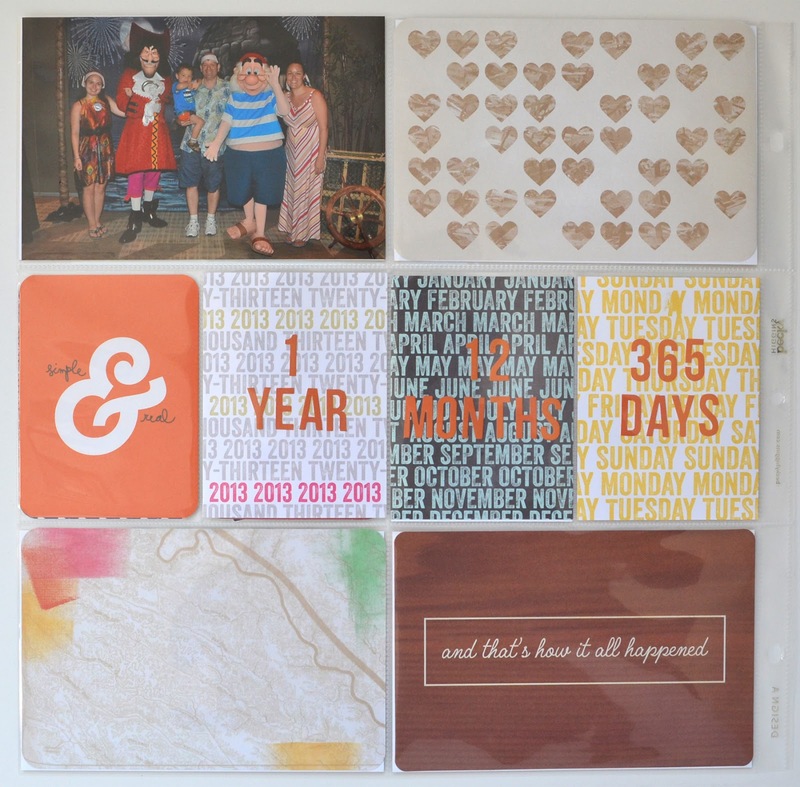 I also am going to be working on at least two paper Project Life albums - one for all of our Disney trips, using a variety of kits, and one for our wedding, using the Olive Core Kit. I do hope I can still provide you guys some inspiration, even though I'm choosing the digital route for my 2014 Project Life album.